After a visit to S'Mac on East 12th Street with my 10 year old vegetarian niece, we had some leftovers. I, of course, actually finished all of my Garden Lite nosh portion with Cheddar, Parmesan, roasted cauliflower and portobello mushrooms, roasted garlic, broccoli and scallions. But with the leftover portion of the All American (American and Cheddar cheeses) I decided to try my hand at Mac-n-Cheese Croquettes. In individual bowls put the beaten egg, some flour, some panko breadcrumbs. Season the flour with salt, pepper, paprika. Season the beaten egg with some drops of hot sauce. With the leftover mac-n-cheese make little logs, squishing everything together so that they are well formed. Dust the logs in the flour, coat them in the egg mixture, roll them until fully coated in the breadcrumbs. In a saute pan add some olive oil and pan fry them until crisp and brown on all sides. 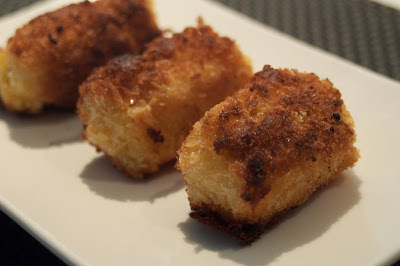 The result is a melty, cheesey, crispy croquette version of mac-n-cheese. It's like the best part of the mac-n-cheese, the breadcrumb topping, but all over in every bite. Fish Taco Leftovers? Fish Taco Quesadillas!